In my ongoing quest to learn to love Campari (shudder), this week I whipped up a Jungle Bird (pictured above). I figured that, seeing as it contained numerous other ingredients that I like – rum, citrus, pineapple – there was a good chance I’d appreciate what the Campari added to the mix, and wouldn’t reject the drink simply because I could taste, well, Campari in it. As usual I was partly right and partly wrong. I did appreciate the way Campari added a bitter complexity and notes of burnt orange to the cocktail. But that didn’t mean I liked it. For me, the Campari flavour overrode the nuances of the rum, though perhaps that’s because I was seeking it out, the way a beautiful person will look for a flaw in their appearance. The CTO said he liked the way it balanced out the rum’s sweetness, and that it was an interesting and well-rounded drink. I thought the drink might be better without it, and so I made another one, omitting the Campari. It just didn’t have enough ‘wow’ factor for me. So in the end, the best thing I can say about this experiment is that it gave me an excuse to open my first bottle of Kraken black spiced rum, which I’ve been wanting to try for ages simply because of the label (yes, I’m a sucker for packaging). I’m no rum aficionado, but it’s delicious. And hey, I got to try out two new cocktails – can’t complain about that. If you want to try them out, the recipes are below. The Jungle Bird recipe is in Dan Murphy’s Cocktail Discovery Guide – edition 2. If the classic smoky, tangy whiskey sour is your favourite winter tipple, then the jam sour – essentially a whisky sour with (you guessed it!) jam and soda – is all set to become your favourite summer drink. Sure, jam in a cocktail sounds a bit weird, but the breakfast martini contains marmalade, and it’s a classic, so why the hell not use jam in a whisky-based drink? The jam gives it a sweet roundedness that highlights the whiskey’s smokiness, and the soda lightens up the whole shebang and gives it a refreshing vibe, lifting it out of the moodily lit lounge room and into the sunshine. So what are you waiting for – go jam one in your cakehole! Add the jam, lemon juice and sugar syrup to a shaker and shake really hard. Add whiskey and orange bitters, plus enough ice cubes to half-fill the shaker, and shake even harder. Fine-strain into a glass that’s about a third full of ice. Top with soda, garnish and serve. Adapted from Dan Murphy’s Cocktail Discovery Guide (edition 2), which suggests you use a Collins glass and a grapefruit garnish, and whichever jam you fancy (but not an actual jam fancy, since that is a biscuit, and while adding jam to a cocktail sounds weird enough, adding a biscuit would probably just be gross). OK, fine, it’s not cool to admit this, but I hate olives and I do not like Campari, and that’s an understatement. It’s also a statement that makes it exceptionally difficult to proclaim my love of gin, since most people associate gin with martinis and martinis so often contain olives – and, to be honest, I’m still not even sure I like martinis without olives – and since apparently, if you like gin, not liking Negronis – which contain gin, vermouth and Campari – makes you a Bad Gin Drinker. Sigh. It’s not like I haven’t tried. Every now and then I pluck up the courage to eat the salted bit of disgusting briny rubber that is an olive, or take a sip of something containing Campari without making a face in the process, convinced that one day, one bright, shining, magical day, I will find an olive – or, better, a Campari-based drink – that I don’t hate. I had hoped the Boulevardier – basically a Negroni with rye whiskey instead of gin – would fall into the latter category, but on the first sip I really wasn’t sold on it (the deliciously subtle rye whiskey was almost entirely eclipsed by the ‘Pay attention to me!’ Campari) and by the end of the drink I was too far gone to tell. I will say this for it: I don’t hate it the way I hate the waste of good gin that is a Negroni (though I’d rather enjoy my rye without cramping its style, thanks all the same), and it’s an enjoyable enough way to get hammered while still impressing the bartender by ordering a reasonably ‘cool’ drink – these things are strong! In short, if you like Campari, you will probably like this drink. If you don’t, I salute you. Add liquid ingredients to an ice-filled mixing glass. Stir until well chilled, then strain into a tumbler that’s half-full of ice. Garnish with the orange slice. The Boulevardier is thought to have originated in 1920s Paris, but this particular recipe comes from a 2016 Dan Murphy’s catalogue. Here’s an easy twist on the once-trendy tequila sunrise that might just bring it back into vogue – or, at least, into Cosmo. (It’s already winning points for its ability to inspire both a terrible magazine pun AND a cocktail pun in one phrase.) Adding orgeat or falernum (use whichever you have on hand) adds a luxurious or tiki vibe, respectively, to this brightly coloured crowd-pleaser. Half-fill the glass with ice. Add the tequila, orgeat or falernum and enough fresh orange juice to fill the glass, and stir. Pour the grenadine over the back of a bar spoon – it should slowly settle into the glass to create the ‘sunrise’ look. I really shouldn’t take credit for just adding an ingredient to a classic cocktail…but I will. In a break from our usual programming, this week 52 Cocktails brings you a guide to Australia’s best micro-distilleries. After all, you can’t make a great cocktail without great ingredients! In case you were wondering, yes, the article was written by yours truly and published by Lonely Planet, the world’s best independent travel-guide publisher. 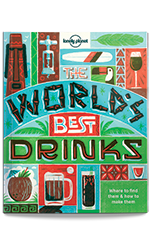 Lonely Planet also publishes books on food and drinks, including this beauty, World’s Best Drinks, which you can buy here. Thanks to everyone who helped me research these articles, supplied stunning photos or simply taste-tested their way to oblivion, and a massive thanks to Lonely Planet for publishing my work. And if you’re reading this, thank YOU for doing so.